This year, there are new ways to play FIFA Ultimate Team. 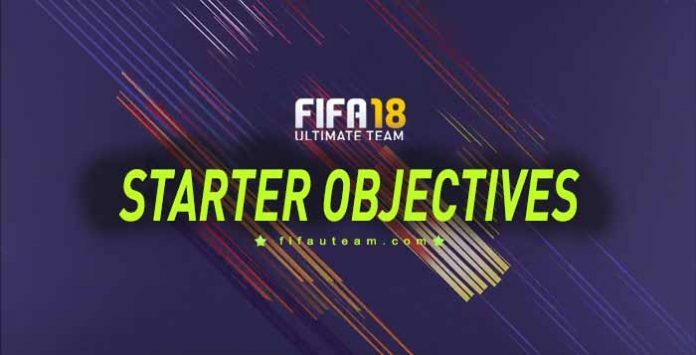 In this page, you will be able to discover the FIFA 18 Starter Objectives List featuring the rewards for each one and detailed instructions step by step about how to complete them. Complete the Starter Objectives in-game or in the new web and companion app to earn great rewards in FUT 18. Get started with your Ultimate Team season and open your starter squad pack. You just need to start FIFA Ultimate Team for the first time. Play your first FUT match. You’ve gotten familiar with your squad and made a few adjustments. Let’s get down to business and play a match. Play any Ultimate Team match, including season, tournaments or Draft. You only need to finish a match. It doesn’t matter if you win or if you lose. From the main menu, navigate to the single player or online tab. Select a season or tournament to get into a game. The best managers always have an eye on the Transfer Market looking to scoop up a bargain or make a big splash for the club. Head to the Transfer Market and buy a player for your team using Bid or Buy Now. Go to the transfer market and bid or bin for a player. The task is only completed after you buy the player and, like all the other tasks, if you buy him using the console. From the Main Menu, locate the Transfer tab to head to the Transfer Market. Adjust the filter to search for the type of player you want for your team. After searching, select a player and place a bid, or use Buy Now to bypass the auction process and complete the deal immediately. Throughout the course of the season, a manager’s job is to evaluate player performances and try to improve the squad and its chemistry by bringing in new players. Swap some players into your squad from your club. On the squad screen, select a player and bring up the actions menu. Choose Swap Player, then use the filters to find the type of player you want to swap into your squad from your club.Additionally, you can also bring a player from your club into your squad by highlighting an empty position and selecting the Add Player option. Go to you squad screen, select a player, press X (XBox) or Square (Playstation) and then choose ‘Swap Player’. Press Y (XBox) or Triangle (Playstation) and confirm. Your club, your name. Personalize your Ultimate Team club by giving it a custom name and abbreviation. To change your club name a second time after completing this objective, redeem the ‘Change Club Name’ item from the EASFC Catalogue. Press A (XBox) or X (Playstation) and then give a new name and abbreviation. Will your team be geared towards attacking or defending? Different squads play with different styles, and the formation they use helps set that tone. On the squad screen, use LT (XBox) or L2 (Playstation) to activate the formation change option. Navigate through the different formations, then select the one of your choice. Go to you squad screen, press LT (XBox) or L2 (Playstation), move right or left and confirm with A (XBox) or X (Playstation). The task is only completed when you choose a new formation. Players naturally tire in a match and over time it takes its toll. Your job is to make sure they recharge so they are ready for the next match. Apply a fitness item to one of your players. On the squad screen, move left or right through item views and locale player needing fitness. Bring up the Actions menu and select Apply Consumable. Navigate to Fitness and choose one item to apply to your player. Go to you squad screen, select a player with low fitness, press X (XBox) or Square (Playstation), Apply Consumable, press RB (XBox) or R1 (Playstation) and confirm. You cannot apply a fitness card to a player with full fitness. If you don’t have any fitness card, go to Transfers – Transfer Market – RB (XBox) or R1 (Playstation) – filter by fitness – Y (XBox) or Triangle (Playstation) – buy one card – send it to your club. Play a FUT single player seasons match. Continue making progress in FUT Single Player Seasons, you get bonus coins or rewards for completing each season. Navigate to ‘Single Player’ and then ‘Single Player Season’. Arrange your Starting 11 into their correct positions. Match the position on each player item to the base position on the pitch (CB-CB). The position indicator on the pitch will turn green once players are in the correct position. This will increase your chemistry and make your players perform better. Chemistry is the links between players on your squad. The more links, the better your players will play. Create orange links between players by matching any of the following: league, club or nationality. On the squad screen, move left or right to switch to the player chemistry view and shows nationality, club and league. Move players around to match 2 of their nationality, club or league. This will create a green link between them. Go to you squad screen, select a player, press X (XBox) or Square (Playstation) and then choose ‘Swap Player’ to find a player who links with the team mates. Press Y (XBox) or Triangle (Playstation) and confirm. Players need contracts. Once they reach zero they are no longer permitted to play in matches. Extend a player’s contacts to increase the number of games he can play for the club. On the squad screen, move left or right through item views and locale player needing contracts. Navigate to Contracts and choose one item to apply to your player. Go to you squad screen, select a player running out of contracts, press X (XBox) or Square (Playstation), Apply Consumable, press RB (XBox) or R1 (Playstation) and confirm. If you don’t have any contract card, go to Transfers – Transfer Market – RB (XBox) or R1 (Playstation) – filter by contracts – Y (XBox) or Triangle (Playstation) – buy one card – send it to your club. Navigate to ‘Single Player’ and then to ‘Team of the Week’. The Transfer Market has more to offer than just players. Different kinds of consumable items allow you to heal, train and change the style of your players. Head to the Transfer Market and purchase a contract item. Go to the transfer market, select consumables and filter by contracts. The task is only completed after you buy the item and, like all the other tasks, if you buy it using the console. Select the consumable tab and adjust the filters to search for the type of consumable item you want for your team. After searching, select the contract item and place a bid, or use Buy Now to bypass the auction process and complete the deal immediately. Create one green chemistry link between two players. Go to you squad screen and place two players from the same club or nationality + league next to each other. Buy a player off the Transfer Market. Navigate to ‘Single Player’ and then go to ‘Single Player Season’. You have to win a match to complete this task. Exchange a player you don’t want anymore for coins. Send a player to the transfer list and set the initial price, bin and duration. In My Club, use the filters to find a tradeable player to sell on the Transfer Market. Select the player you wish to sell and bring up the Actions Menu. Select List on Transfer Market then enter the price you wish to sell him for. Select List on Transfer Market once more to confirm. Build a squad with 90 chemistry. Go to your squad screen and build a team with yellow and green links, in order to reach chemistry 90. Complete a squad building challenge. Navigate to the single player tab, then select the squad building challenges tile. Select a group to get started on an individual challenge. Navigate to ‘Single Player’, then go to ‘Suqd Battles’ and play a match. Q: How do I get the reward? A: Once you complete an objective, go to the Starter Objectives screen and confirm ‘claim’. Q: Do I have to complete objectives by the order listed? A: No. The order doesn’t matter. However, you have to follow the groups order. Q: How many times can I complete an objective? A: Only one time for each objective. Q: I haven’t received my reward. What I should do? A: Ask for help to EA Support, please. Hi. Are you playing on PS3 or XB1? I’m asking this because objectives are not available on these platforms. If you play on PS4, XB1 or PC, then go to the first screen of FUT and select ‘Objectives’.